This textbook is intended to identify and explain engineering procedures for the design and operation of renewable energy systems. The first chapters include a review of conventional electrical power systems as implemented in the United States and common to all electrical systems throughout the world. Several other types of renewable energy systems are introduced. 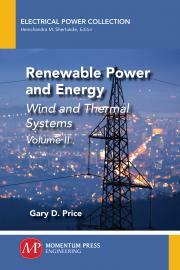 The heart of the textbook is focused on the design of interconnected and stand-alone wind and thermal systems. Battery storage is becoming an integral part of renewables, and a significant portion of the textbook is dedicated to energy storage for stand-alone and back-up power systems. Economics considerations are included as an essential part of the engineering design process. Gary D. Price is an affiliate professor at the Metro State University of Denver. He teaches a renewable energy course for the electrical engineering technology (EET) department. Gary also owns Sunnyside Solar, a renewable energy company that designs and installs solar electric systems for residential and commercial customers. Gary holds a BS degree in electrical engineering from North Dakota State University, an MS degree in electrical power engineering from the University of Colorado, and an MBA degree in finance from the University of Denver.